Durable long lasting lifts! 2 sides to fit your needs! Power lift for more revs or oval lift for the comfortable release! Vise's #1 selling insert. The power lift/oval combination gives you two grips in one. The sizing will have to be determined by measuring your fingers. Most pro-shops have a tool that will help to get your insert sizes so you may check you local pro-shop for sizing tips and answers. Hi inserts, these inserts are sold individually. I'm looking for oval thumb inserts. Are these thumb or dinger inserts? Hello Bernie! These particular inserts are finger inserts. You will, more than likely, need to speak to your driller about that. Does the yellow grips look more neon like the image? They will be pretty yellow but not a neon yellow. how many pieces in a box. There is only one piece per box. 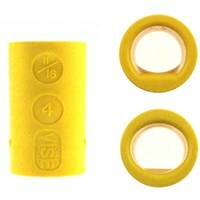 Due to the time it takes to produce the VISE Power Lift & Oval Grip Yellow ball it will ship in immediately. We cannot ship this ball outside the United States.